An update on Steve Abraham’s one year time trial record attempt. At approximately 8.10am on the 29th March Steve was involved in an accident. He was hit from behind by a suspected drunk motorcyclist. He did attempt to carry on, but was forced to stop after a further 30 miles. His support team collected him and took him to hospital, where it was found he sustained two broken bones in his ankle. He had the ankle put into plaster. “Steve is now out of hospital (after his operation to have metal plates fitted to his ankle) and is recovering at home. He has decided to continue with the record attempt and as a team we are very seriously considering running a concurrent record attempt, starting sometime in the late summer this year after Steve should have made a full recovery. This is within the UMCA rules for this record attempt, so neither record attempt would end if he started again in the summer. Steve is due to lose his advantage on the current record (and be roughly at the same mileage Tommy Godwin was at the same time of year), strangely on 11th April, which is HAM’R day. 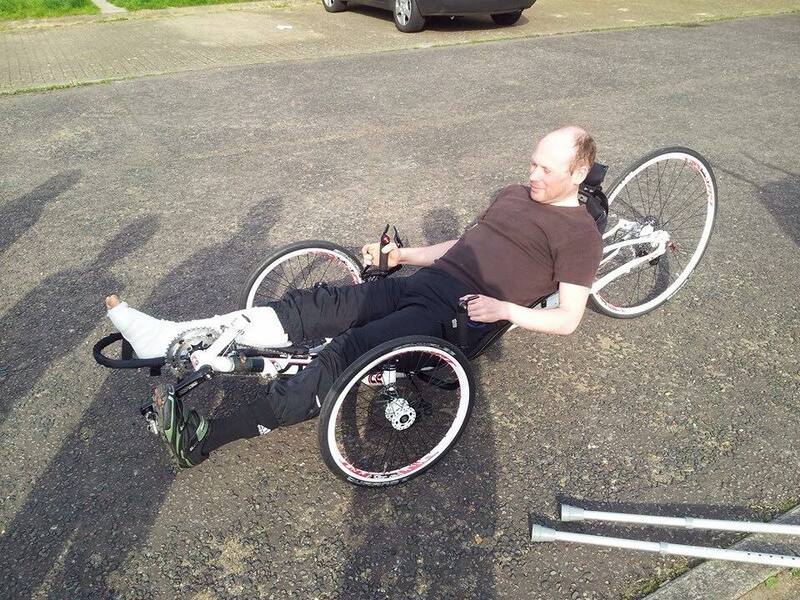 To mitigate that loss we are now looking into Steve using a recumbent trike. Steve has asked several medics and doctors whether this was wise to do ( when he was at hospital) and had no negative feedback. Riding a recumbent trike will mean that he can sit in an ideal position for recovery from his injuries, with the ankle raised. So as far as the injured ankle is concerned, it should be no different to sitting on his couch at home. Being outdoors will also give the benefit of extra vitamin D, which is very good for his bones. We can use the Milton Keynes Bowl for Steve to ride on so that Steve is never far from home and will be riding on a traffic-free circuit used for road racing. We anticipate Steve to be travelling very slowly, as he will be riding one-legged on a different kind of bike to what he normally rides, but if he can manage 5-10mph for 10hrs a day he should reduce his losses by over 2,000miles by the end of April. The doctors have given him 6weeks before the injury will have recovered enough to be weight bearing. On the negative side, the losses could be too great to recover. We don’t know if Steve will recover fast enough to get back up to speed and meet his very demanding summer schedule, in order to re-catch what Tommy Godwin did in 1939. We don’t know for sure if this plan will work. On the positive side. Steve was going from strength to strength during the first 3months of the record attempt and when he set off for Exeter last Saturday he felt stronger than he had all year. He has now had a good amount of recovery time after the accident. Although we don’t know if Steve can meet the demanding summer schedule as soon as he is fully recovered from injury, we don’t know that he can’t either. It also seems possible that he could make a very good and fast recovery. We will have a better idea when he sees the doctor in 2weeks on how he is recovering. Of course, we don’t know either way how it will go. But because we can keep this record attempt going without putting another record attempt at risk ( and riding on may even be helpful to Steve’s recovery – and still have a fighting chance of achieving what he set out to do ), it seems logical to give it a try. All of us at OSMTB wish Steve a quick recovery and hope he does get to continue with his record attempt. Info and pictures copyright Steve Abraham.